Filled with exotic art nouveau style, this Mucha Autumn tapestry shows the work of Alphone Mucha (1860-1939). Here, his favorite subject of the mysterious woman who personifies the seasons, is walking holding a basket of fruits. Her robes are accented in crimson, which accompanies the golden browns beautifully. She has an intense stare, and full brown hair and is decorated by both her outfit as well as the border and background of the work itself. 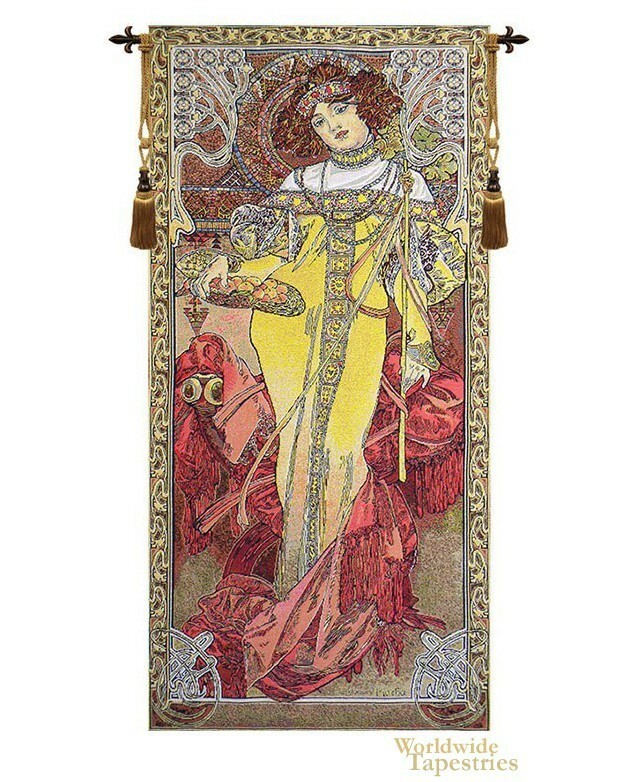 This fine art tapestry "Mucha Summer I" is backed with a lining and has a tunnel for easy hanging. Note: tapestry rod and tassels, where pictured, are purchased separately. Dimensions: W 17" x H 41"
Dimensions: W 26" x H 60"